101 in. x 132 in. The work of Travis Somerville functions as a craft of anti-nostalgia and critical memory and his sharp and creative insistence on how images and material objects are never merely inanimate relics of a past far removed from our presents or our futures. Somerville compels us to reconsider and repudiate the standard measure of America’s history of white supremacy and racism as a progressive narrative that has seemingly ended on an utopian note of post-race. The artist's work demonstrates a scripting of American history that forgoes this progressive wish fulfillment, a rhetoric of non-culpable hope. 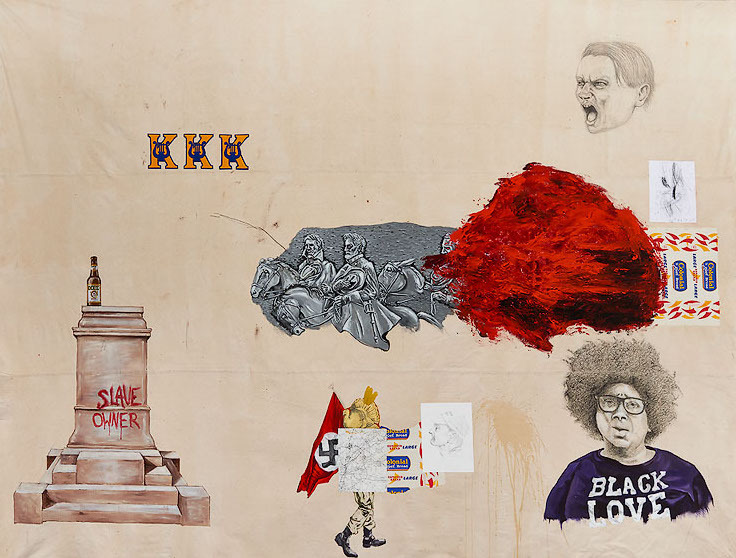 Instead, Somerville’s work intermingles visual and verbal references to the semiotics of the Civil War, Reconstruction, Jim Crow, the Civil Rights Movement, and the Age of Obama. As Somerville himself points out that his work complicates the sense of a collective memory about how race has shaped the political, historical, cultural, and social contours of America: “As I attempt to navigate the terrain between autobiography, history, and art, all sorts of collisions take place. It is these interesting moments and the inconsistencies that inform them that I try to capture in my work.” Through the restaging of old advertisements and newspapers, vintage money bags and cotton sacks, and the poignant juxtaposition of his drawing and painting against found photos, Somerville brilliantly entices the viewer to marvel over the aesthetic power of American culture’s everyday brutality and myopia. What more could one want from art? The tumultuous history of race relations in the South has been, in large part, buried and left to fester in the years since the Civil War. While culture is intangible and abstract, its artifacts are available as evidence of its existence. Born in Atlanta, Georgia and raised throughout the South, Travis Somerville unapologetically picks at these old wounds by exposing the popular objects and iconography of Southern culture. Somerville’s use of imagery is complex and shaped significantly by his personal relationship to it. His critical eye works in the shadow of his own nostalgia and consequently attempts to reconcile the idealism of his religious upbringing with the racial and political turmoil of his past. © 2014. Travis Somerville. All Rights Reserved.